Here's a puzzle my son put in my Father's Day card. He wrote, "In the figure below, fill in each of the sixteen numbers from 1 to 16 such that the four rows and three columns (use the lines as a guide) add up to 29." So I decided to attack it from another angle, just look at the rows first. There are four rows, let's call them rows a, b, c, and d from top to bottom. Row a has a 3-tuple in it, b has a 4-tuple, c has a 4-tuple, and d has a 3-tuple. I wrote an algorithm that first finds all the 3-tuples and 4-tuples that add up to 29. From those sets of valid 3-tuples and 4 tuples, the algorithm chooses a 3-tuple, a 4-tuple, another 4-tuple, and finally a 3-tuple. It assures that there are no duplicate numbers across any of the tuples. Then if that's true, it checks the three columns, and if they add up to 29, it prints the winning results. And voilà, it worked, and demonstrated that there are multiple solutions, and found them in mere seconds! I saved that initial implementation as a gist. I thought I was done, but the code was bugging me. I knew that while it reflected the way I approached the problem, it was inefficient (it did too many comparisons), it included duplicate solutions (that's the "wrong" part of it), and it wasn't Pythonic. So, a few hours later, I refactored the code, and realized I could replace four nested "for" loops (one for each row) with two loops that each choose two items from their containers (one container of 3-tuples, and one of 4-tuples). And I could check for no-duplicates on one line using a set() instead of explicitly checking for duplicates with "any(this in that)" calls. The red lines are being replaced by the green lines. 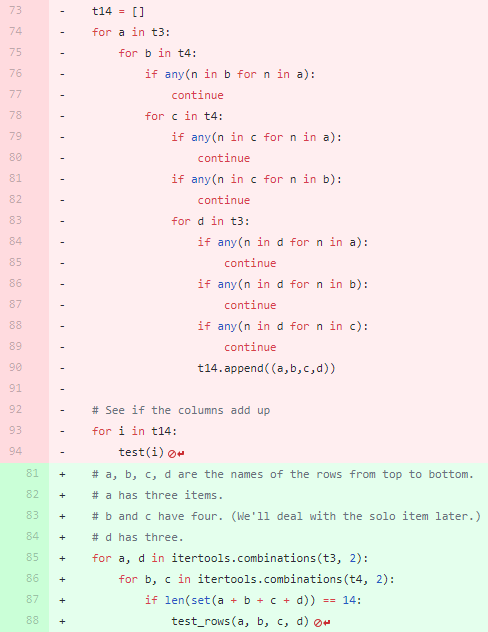 It's nice to see lots of code being replace by fewer lines of code. I was wrong about it being faster! Profiling showed that while the change above was more correct because it didn't include duplicate results, it was inefficient because it lacked the earlier pruning between the for loops from the first try. Once I restored an "if" call between the two new for loops, the program became faster than the first run. It's very rewarding to bend your way of thinking to different types of solutions and to be able to verify those results. This feeling is one of the reasons I still code. Here's the final version of the solution generating code.